At the start of 2006 James was a typical three year old. He was energetic, inquisitive and full of life. By April things were changing. He started complaining about his legs hurting, he was very lethargic and did not want to play in the garden. All he wanted to do was sit on the sofa and watch TV. He had just got over a cold so we thought he was just a bit run down so we gave him some over the counter medicine and thought he would pick up. A couple of days later whilst out walking with Michelle his legs buckled underneath him and he fell to the pavement. The bruises that appeared on his arms and legs were instant and big. We immediately called our doctor to book an appointment. We were called back by a triage nurse to assess whether the appointment needed to be urgent. After we told the nurse James symptoms of tiredness, lack of colour, bruising and weak legs we were given an appointment for 6 days time. We were relieved because we felt it couldn’t be anything serious. Two days later James was looking grey and was lying on the sofa with no energy whatsoever. We took him to our local hospital where he was admitted. He had blood tests and x-rays and then the moment that no parent should have to experience. 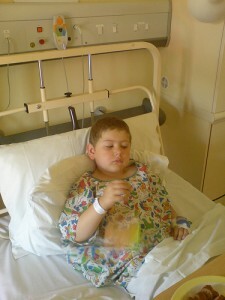 We were taken away to an office and the doctor delivered the news….James has leukaemia. Michelle collapsed into my arms in tears. I was in shock. This wasn’t happening. It was all a dream. That night I lay next to James on his hospital bed whilst he was hooked up and having his first of many blood transfusions. I lay there thinking about how I was going to tell everyone. I even started thinking about his funeral. What has followed is two and a half years of chemotherapy, transfusions, tablets, biopsies and a lot of determination on James part to beat this vile disease. James story is not unique. His story is repeated every day by children all over the UK. 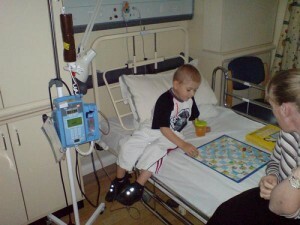 Brave children just like James fighting a daily battle just to stay alive. I have met some of these children and they inspire me to make a difference. The “BCCA” will make that difference. I am honoured to be working with these amazing parents who like me are inspired by our children to make a change. A wonderful touching story. I have followed James’s story for a long time. These children are heros and angels. I can only wish him a wonderful future. I have a grandson in remission from bladder cancer. However, as a nurse of many years experience I am APPALLED that given the signs and symptoms, he was not seen and investigated IMMEDIATELY. 6 days?!! To be working in triage and to miss the need for immediate attention of the symptoms is REALLY worrying. Whoever that nurse was she / he needs serious retraining. Having lost my own James to leukemia, I was captured by the “James and Daddy” page on MySpace. I’ve been mostly on Facebook for some time (does he have a page there?) and haven’t followed his story. I’m pleased to know that he’s still hanging in there. Mike, we are sorry to hear about the loss of your son James.